Development to a large extent determines the way in which hazards impact on people. Meanwhile the occurrence of disasters alters the scope of development. Whilst a notion of the association of disaster and development is as old as development studies itself, recent decades have produced an intensifying demand for a fuller understanding. Evidence of disaster and development progressing together has attracted increased institutional attention. This includes recognition, through global accords, of a need for disaster reduction in achieving Millennium Development Goals, and of sustainable development as central to disaster reduction. However, varied interpretations of this linkage, and accessible options for future human wellbeing, remain unconsolidated for most of humanity. 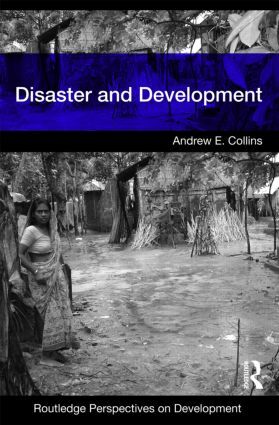 This engaging and accessible text illuminates the complexity of the relationship between disaster and development. It opens with an assessment of the scope of contemporary disaster and development studies, highlighting the rationale for looking at the two issues as part of the same topic. The second and third chapters detail development perspectives of disaster, and the influence of disaster on development. The fourth chapter exemplifies how human health is both a cause and consequence of disaster and development and the following chapter illustrates some of the learning and planning processes in disaster and development oriented practice. Early warning, risk management, mitigation, response and recovery actions provide the focus for the fifth and sixth chapters. The final chapter indicates some of the likely future contribution and challenges of combined disaster and development approaches. With an emphasis on putting people at the centre of disaster and development, the book avoids confronting readers with ‘no hope’ representations, instead highlighting disaster reduction opportunities. This book is an essential introduction for students from multiple disciplines, whose subject area may variously engage with contemporary crises, and for many other people interested in finding about what is really meant by disaster reduction. They include students and practitioners of development, environment, sociology, economics, public health, anthropology, and emergency planning amongst others. It provides an entry point to a critical, yet diverse topic, backed up by student-friendly features, such as boxed case studies from the geographical areas of America to Africa and parts of Europe to parts of the East, summaries, discussion questions, suggested further reading and web site information. Introduction: why disaster and development? How do disasters inﬂ uence development?